On January 1, 1977, more than one hundred Czechoslovak intellectuals signed a manifesto named Charter 77. It called on the Czechoslovak government to adhere to provisions from the Final Act of the 1975 Helsinki Accords regarding the freedom of speech. On August 23, 1979, more than 40 Baltic dissidents signed their own manifesto, the Baltic Charter, named thus in honor of Charter 77. Being representatives of an occupied nation, the signers also included political demands in the charter. They demanded the right for the Baltic peoples to decide their own fate, and they also demanded statehood. The Baltic Charter was an appeal to the USSR, West Germany, East Germany, the signers of the Atlantic Charter, and the UN Secretary-General to annul the Molotov-Ribbentrop Pact of August 23, 1939, and to do away with its consequences. Later the Baltic Charter became known as the Baltic Memorandum. 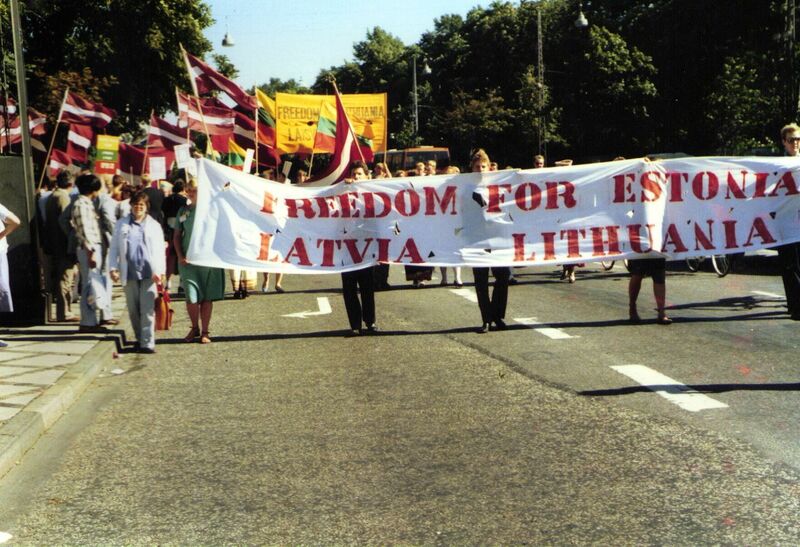 Dissidents from Lithuania's Freedom League organized the adoption of the Baltic Charter. The Lithuanian human rights monitoring movement was the oldest such movement in the Baltic States. The Lithuanian Helsinki Group, which demanded compliance in Lithuania to the Final Act of the Helsinki Accords, was established in 1976. Defenders of human rights in the USSR, led by Andrei Sakharov, supported the Baltic Charter. Their only stipulation was that the inhabitants of the Baltic States vote for independence in a referendum. The text of the Baltic Charter, translated into the Latvian language by the dissident Gunārs Astra. The original, signed on August 23, 1979, was written in the Russian language. 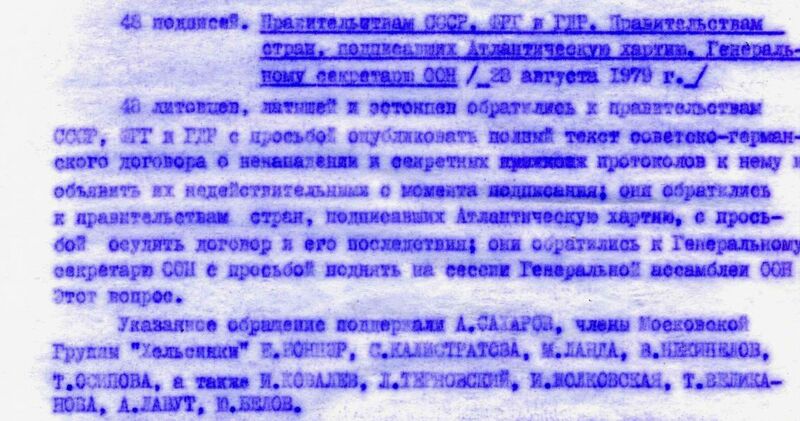 The translation was included in Astra's criminal case as additional evidence of his anti-Soviet activity. State Archives of Latvia 1986 -1- 45322, p.13. 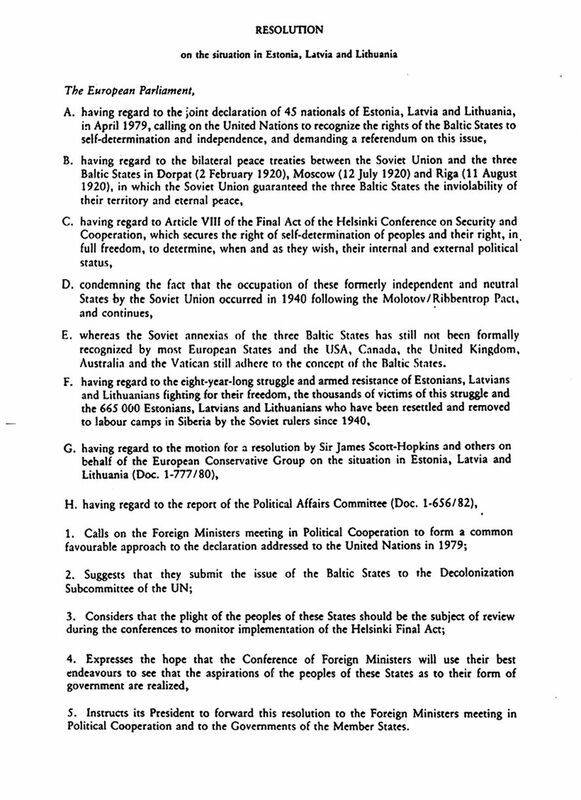 The Lithuanian version of the Baltic Charter, signed by Lithuanian dissidents on August 23, 1979. Lithuanian Special Archives K-1-58-47753/3-10, p. 664 – 11. The signers of the Baltic Charter emphasized that the secret protocol of the Treaty of Non-Aggression between Germany and the USSR signed on August 23, 1939 - the Molotov-Ribbentrop Pact - violated the national sovereignty of the Baltic States and in fact eliminated the three states. The signers of the Baltic Charter noted that the Molotov-Ribbentrop Pact was still legally in force as of 1979. The dissidents stressed that silence from the global community supported the past, present, and future aggressors. 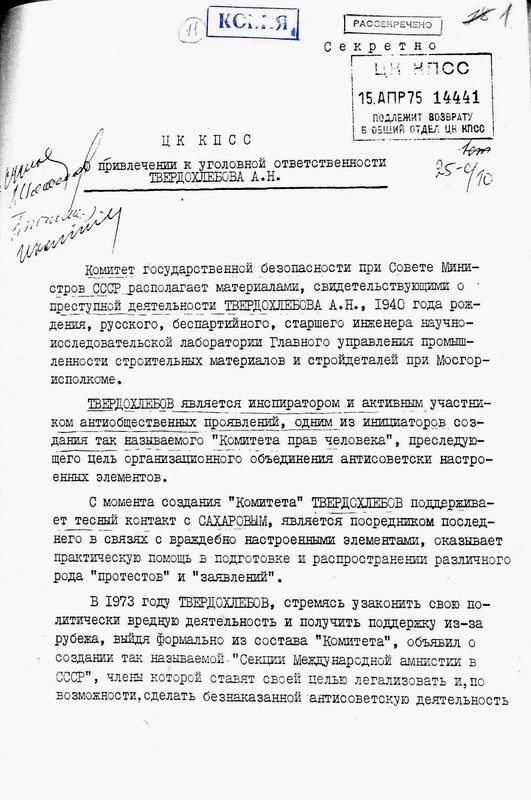 For that reason the signers now turned to the leadership of the USSR with an plea to publish the secret protocol signed by USSR foreign minister Vyacheslav Molotov and German foreign minister Joachim von Ribbentrop regarding the incorporation of the Baltic States into the Soviet sphere of influence. They appealed to the leadership of the USSR to declare the Molotov-Ribbentrop Pact as invalid from the moment of its signing. The signers of the Baltic Charter also asked the leaderships of the Federal Republic of Germany and the German Democratic Republic to declare the pact as invalid and to assist the USSR in doing away with its consequences, namely the removal of Soviet military forces from the Baltic States. The signers of the Baltic Charter appealed to the signers of the Atlantic Charter to strongly condemn the Molotov-Ribbentrop Pact and its consequences. They also asked the Secretary-General of the United Nations to include the Baltic issue in the next UN session, because due to the Soviet occupation the Baltic people were not able to decide their own fates. The Estonian version of the August 23, 1979, Baltic Charter, supported by Estonian dissidents Mart Niklus, Endel Ratas, Enn Tarto, and Erik Udam. State Archives of Estonia 130 SM- 1- 8838- 2, pp. 113 – 114. 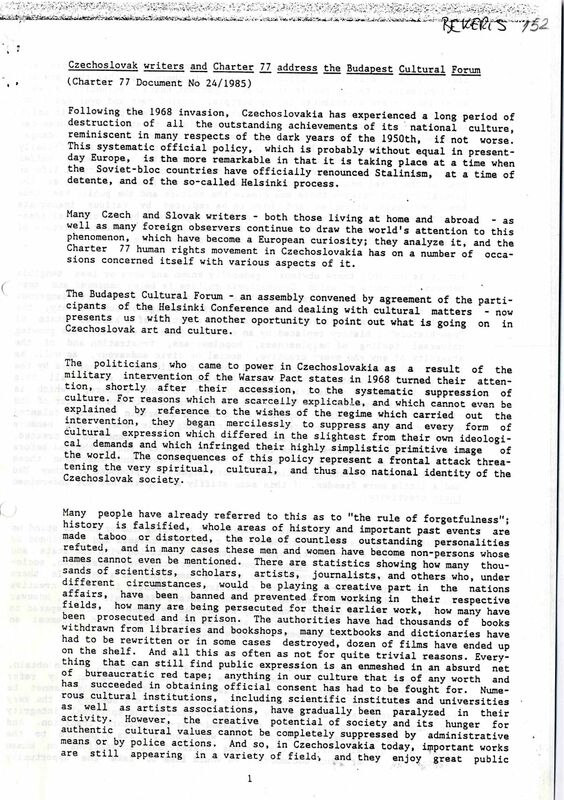 Information about the 1979 Baltic Charter in the samizdat publication “Chronicle of Current Events”, published by dissidents in Moscow. 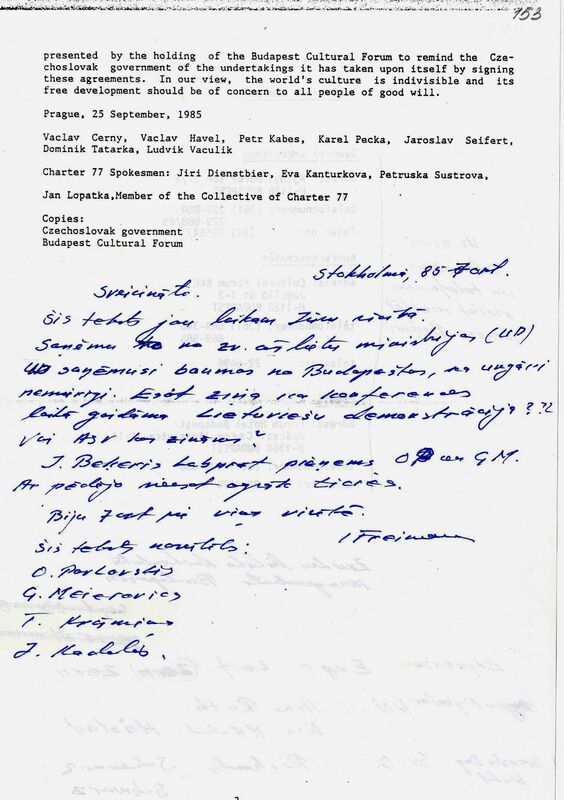 The document states that on August 23, 1979, 48 Estonians, Latvians, and Lithuanians asked world leaders to annul the Molotov-Ribbentrop Pact and do away with its consequences. Several Russian dissidents, including Andrei Sakharov and five members of the Moscow Helsinki Group, supported this demand by the Baltic States. International Society “Memorial” Russian archives on USSR dissidents, 153. f., chronicle no. 54. Antanas Terleckas, a creator of the “Lithuanian Freedom League” and signer of the Baltic Charter on August 23, 1979. Convicted on September 19, 1980, of anti-Soviet activities, including the signing of the Baltic Charter. Photo: personal collection of Arvydas Anušauskas. Ints Cālītis, a Latvian signer of the August 23, 1979, Baltic Charter, convicted of anti-Soviet activities. State Archives of Latvia 2197-1-v-63, p. 2. Antanas Terleckas, a creator of the “Lithuanian Freedom League” and signer of the Baltic Charter on August 23, 1979. Convicted on September 19, 1980, of anti-Soviet activities, including the signing of the Baltic Charter. 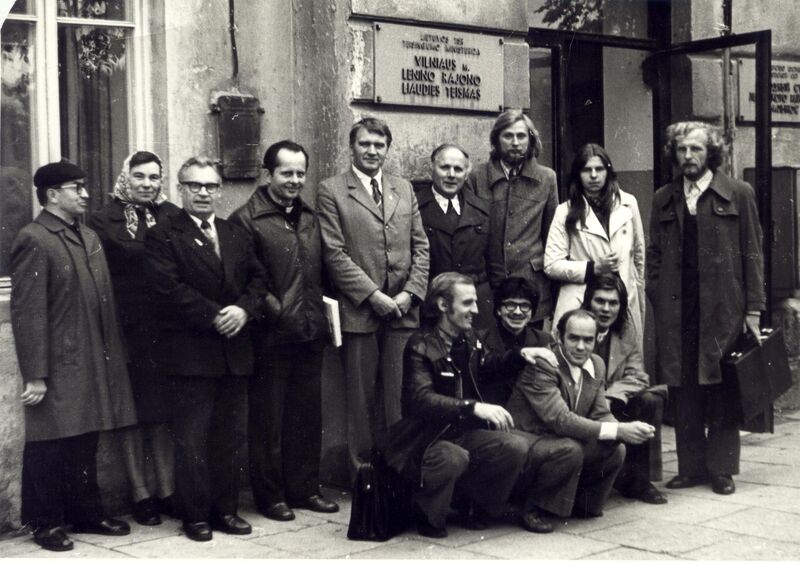 On June 15, 1978, Lithuanian Freedom League founders announced the organization's mission: to promote religious, national, and political consciousness and to move the issue of Lithuanian freedom into international forums. One of the League's goals was to have the secret protocol of the 1939 Molotov-Ribbentrop Pact published and declared illegal. That would mean the restoration of Lithuania's statehood, which the pact had destroyed. 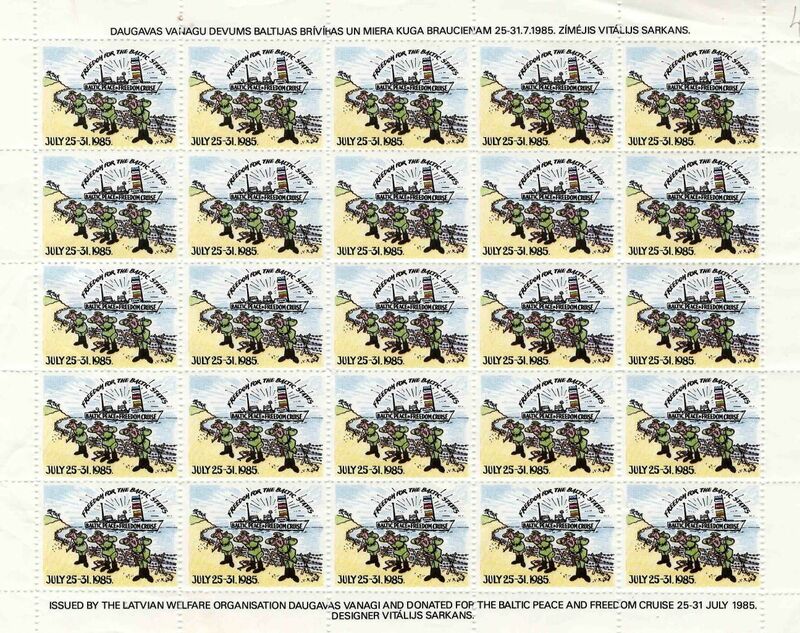 The Lithuanian Freedom League organized the signing of the Baltic Charter on August 23, 1979. Repressions and arrests by the State Security Committee (KGB) of the Lithuanian SSR began soon afterwards. In 1979 and 1980 Lithuanian Freedom League members Antanas Terleckas, Julius Sasnauskas, and Algirdas Statkevičius were arrested, whereafter the League became less active until 1987. On August 23, 1987, Terleckas and other dissidents organized a demonstration against the Molotov-Ribbentrop Pact near the monument to poet A. Mickiewicz in Vilnius. Ints Cālītis was tried three times for anti-Soviet activities. He was convicted in 1949 and 1958 for belonging to an anti-Soviet youth group and taking part in anti-Soviet agitation and propaganda. 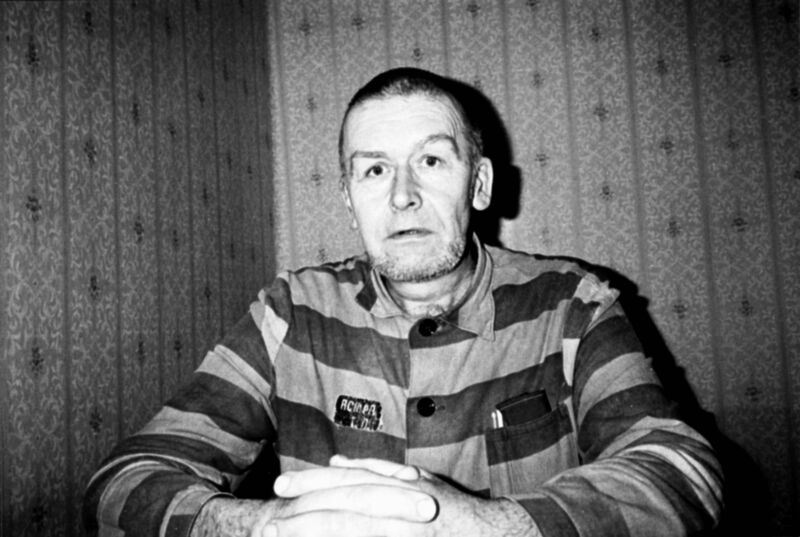 On September 23, 1983, Cālītis was again convicted and sentenced to six years in confinement for anti-Soviet agitation and propaganda. The KGB of the Latvian SSR listed one of his crimes as the signing and distribution of the Baltic Charter on August 23, 1979. Already in 1977 Cālītis - together with Viktoras Petkus (Lithuania), Viktors Kalniņš (Latvia), and Mart Niklus (Estonia), all previously convicted of anti-Soviet activities - attempted to form a committee of Estonian, Latvian, and Lithuanian national movements. A press conference of this Baltic national movement was planned for foreign journalists on August 24-25, 1977, in USSR dissident Piotr Grigorenko's apartment in Moscow, but was disrupted by the KGB. 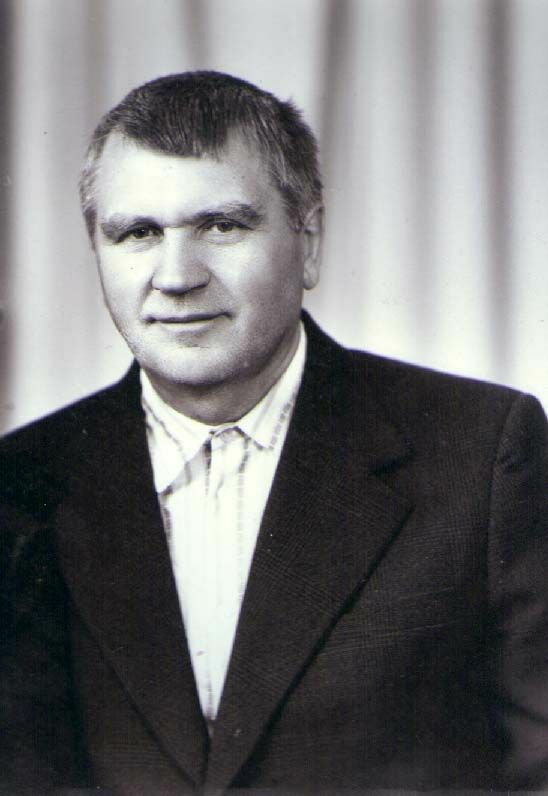 Grigorenko and Latvian dissident Ivan Yahimovich had spoken out publicly against the occupation of Czechoslovakia in 1968.Ints Cālītis was later a member of the Supreme Council of the Latvian SSR and voted for the restoration of the independence of the Republic of Latvia on May 4, 1990. The April 12, 1975, report by USSR KGB chairman Yuri Andropov and USSR prosecutor Roman Rudenko to the Central Committee of the Communist Party of the Soviet Union (CPSU) regarding the prosecution of Andrei Tverdohlyebov, an engineer and defender of human rights. The document states that in 1970 Tverdohlyebov formed the Human Rights Committee and had close contact with the dissident academic Andrei Sakharov. Tverdohlyebov and members of the Russian Section of Amnesty International (also formed by Tverdohlyebov) were also accused of maintaining contact with defenders of human rights in the Baltic States. Andropov and Rudenko believed that these actions impassioned Baltic extremism. Russian State Archive of Contemporary History 89-37-11, pp. 1- 3. Copy. 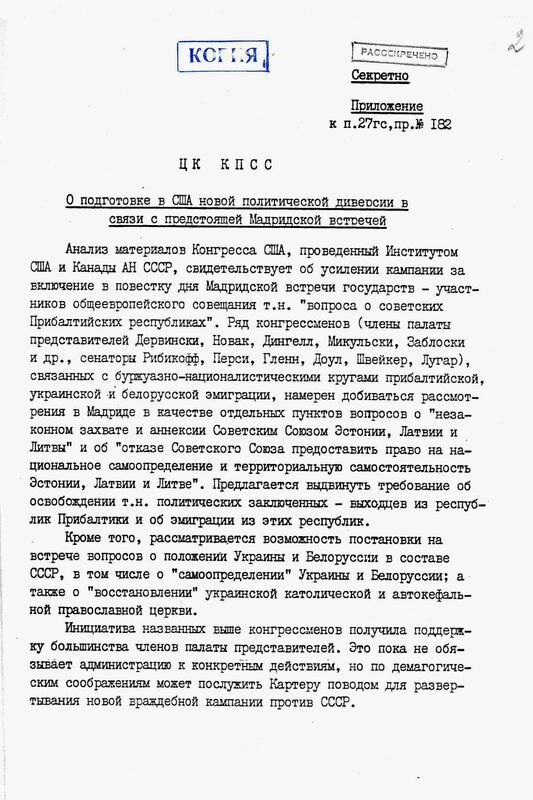 The November 15, 1976, report by the USSR KGB to the Central Committee of the CPSU “Regarding the hostile activities of the so-called 'Public Group to Promote Fulfillment of the Helsinki Accords in the USSR'”. 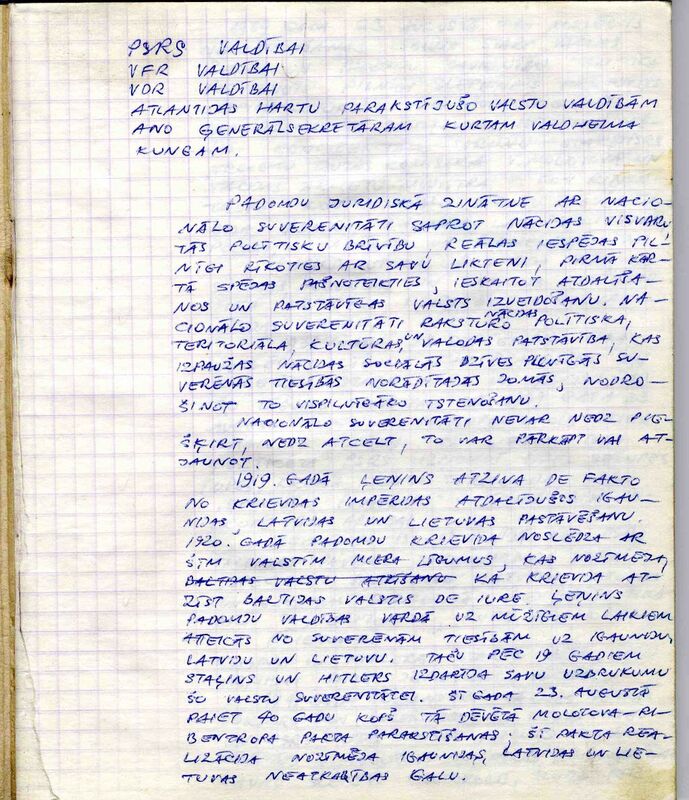 The document states that Yuri Orlov, an associate at the Armenian SSR Academy of Sciences, was collecting evidence about the USSR not fulfilling its obligations to the Final Act of the Conference on Security and Cooperation in Europe (Helsinki Accords) regarding human rights. Russian State Archive of Contemporary History 89-37-4, pp. 1- 3. Copy. 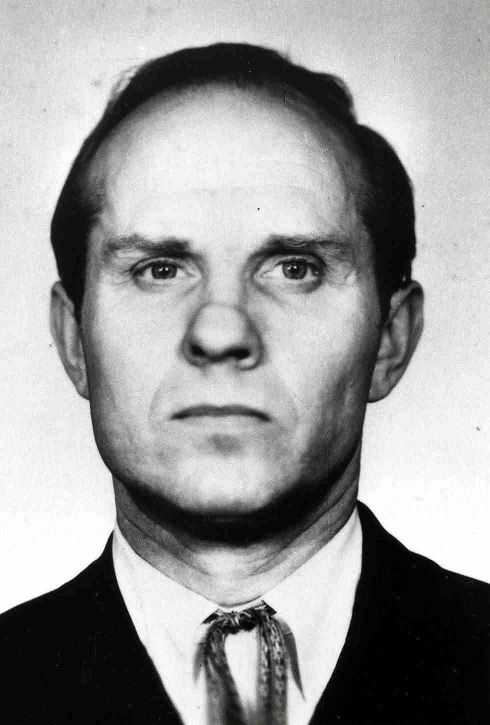 Alexander Ginzburg, later a member of the Moscow Helsinki Group, began contacting several Lithuanian dissidents and defenders of human rights in the mid 1960s. Five members of the Moscow Helsinki Group eventually supported the signing of the Baltic Charter on August 23, 1979. These Lithuanian contacts with the Moscow dissidents secured the USSR dissidents' support of the Baltic Charter. Photo: Gunārs Astra in the KGB building in Riga, January 1988. Latvia State Archive of Film, Photography and Audiovisual Documents arh. nr. 165312N. Photo by Līvija Astra. 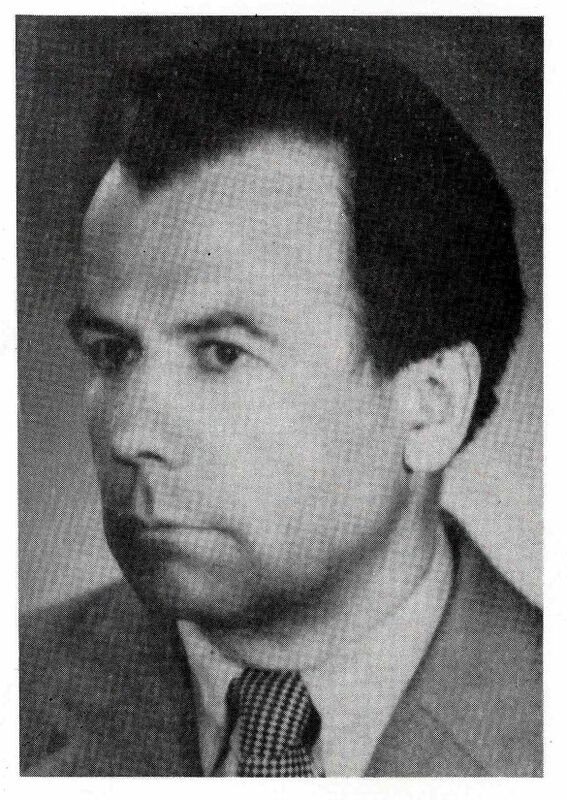 Latvian dissident Gunārs Astra (1931-1988), the translator of the Baltic Charter into the Latvian language. Astra was convicted of anti-Soviet agitation on December 19, 1983, and sentenced to seven years in confinement. His last words in court were repeated on Western radio broadcasts to Eastern Europe and heard by the people of Latvia. They thus became a loud slogan against the occupation of Latvia. Russian State Archive of Contemporary History 89-37-11, pp.1- 3. Russian State Archive of Contemporary History 89- 37-4, pp. 1 – 3. Copy. Mart Niklus, an Estonian signer of the Baltic Charter. Photo: personal collection of M. Niklus. Mart Niklus, an Estonian signer of the Baltic Charter. On April 29, 1980, he was charged with systematic “dissemination of untruthful fabrications in an attempt to denounce the Soviet state and social structure”, which included the signing of the Baltic Charter. 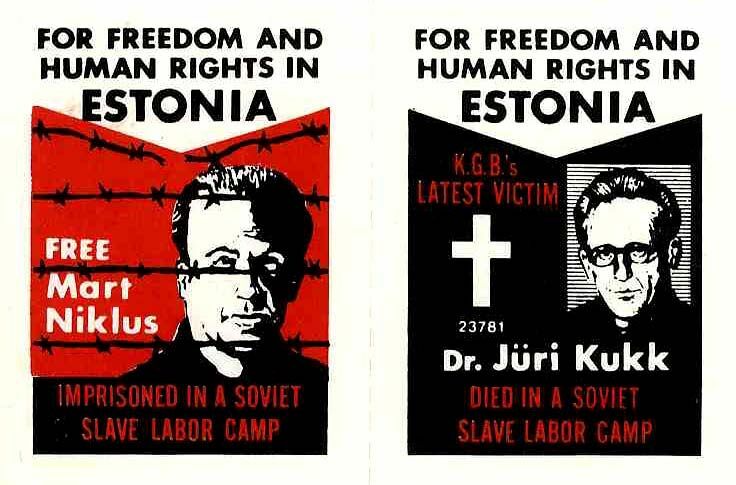 He refused to give testimony to investigators from the Estonian SSR prosecutor's office, refused to answer their questions, and refused to sign any documents. In 1981 Niklus was sentenced to ten years in confinement. This photograph is from a postcard that activists in the West sent to CPSU Secretary General Mikhail Gorbachev demanding the release of Niklus. After his release in 1988, Niklus joined the socio-political movement. The Lithuanian signers of the Baltic Charter in September 1979. 1st row from the left (seated): Algimantas Andreika, Robertas Grigas, Jonas Volungevičius, Kęstutis Subačius. 2nd row from the left (standing): Kastytis Matulevičius, unknown, Mečislovas Jurevičius, Sigitas Tamkevičius, Antanas Terleckas, Algirdas Statkevičius, Liutauras Kazakevičius, Leonora Sasnauskaite, unknown. Museum of Genocide Victims of the Lithuanian Genocide and Resistance Research Center, RF174/21. 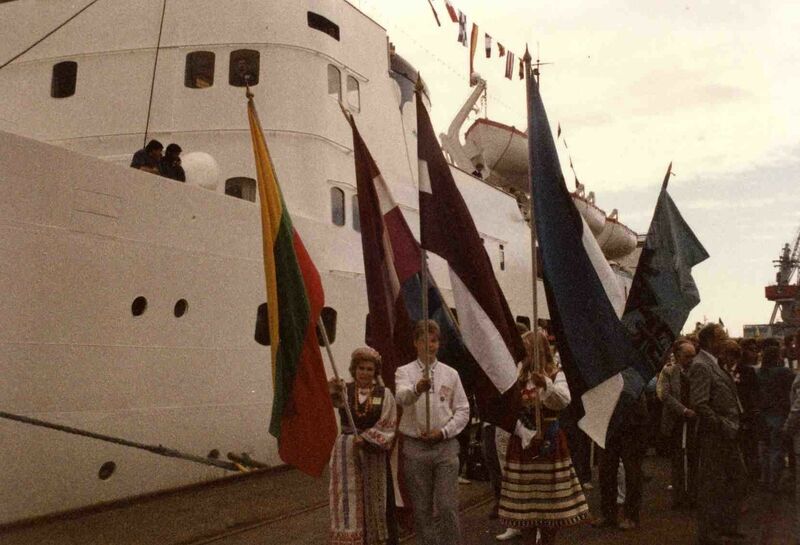 The Baltic Charter was delivered to the West on August 23, 1979. Western radio stations broadcast its contents in the Baltic languages back to the Baltic States, thereby informing the citizens of the charter's demands. The charter also gave encouragement to hundreds of thousands of Baltic exiles worldwide to work even harder towards the restoration of Baltic independence. 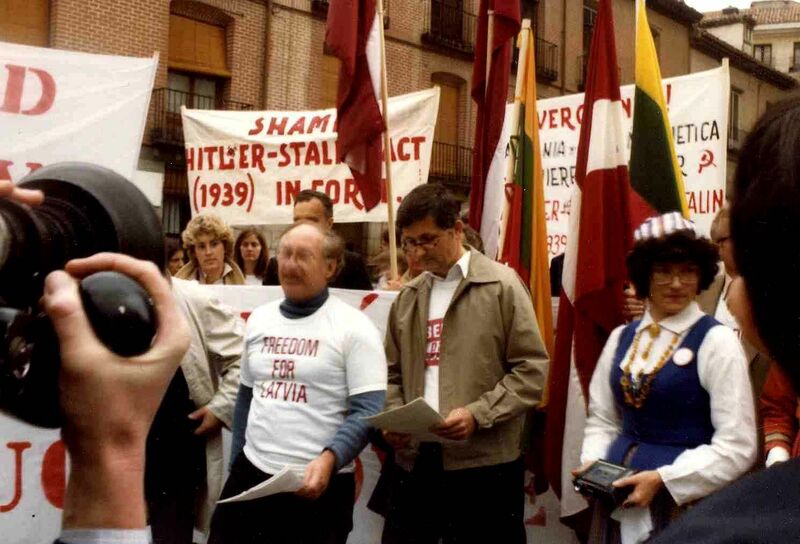 Demonstrations demanding Latvian independence, organized by the World Federation of Free Latvians (PBLA), took place at the October 1980 Conference on Security and Cooperation in Europe in Madrid. On October 2 a press release was distributed at the conference in an effort to inform people worldwide about the recently established Baltic Charter. The PBLA Information Bureau actively provided information and news to European Parliament and Council of Europe politicians. Organizations of exiles from the Baltic States reminded politicians that there would be no stability in Eastern Europe until the issue of the Baltic States was resolved. European Parliament member Otto von Habsburg was an active supporter of the Baltic cause. In large part due to his efforts, the European Parliament passed the “Resolution on the Situation in Estonia, Latvia, and Lithuania” on January 13, 1983. The resolution reminded the world of the Baltic Charter signers' demand for the annulment of the Molotov-Ribbentrop Pact and the elimination of its consequences. The October 8, 1979, letter from PBLA to German chancellor Helmut Schmidt. 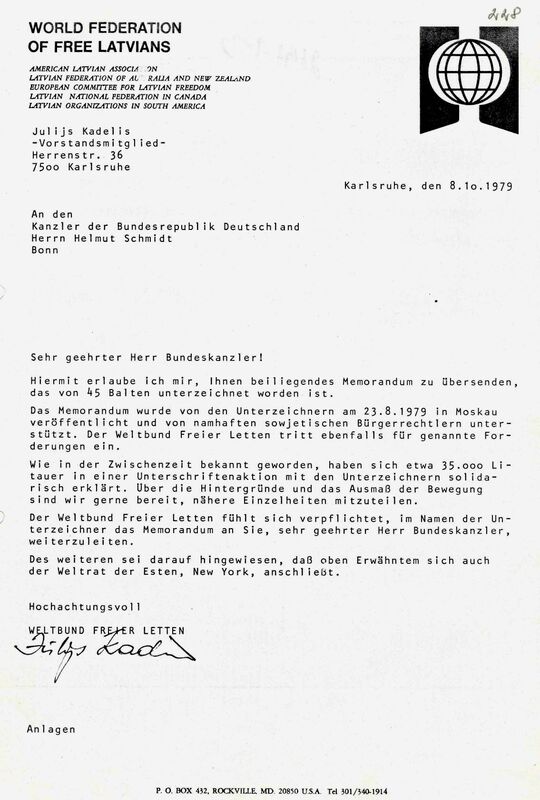 With this letter PBLA reminded the Chancellor of the Federal Republic of Germany about the Baltic Charter signed by 45 Baltic dissidents on August 23, 1979. 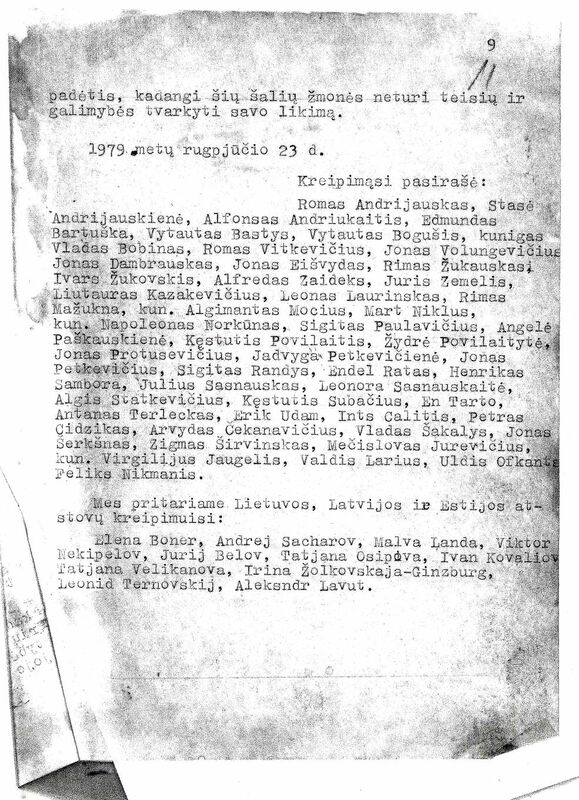 The letter emphasizes that PBLA, as well as Lithuanian and Estonian exile organizations, all support the Baltic dissidents' plea to eliminate the consequences of the Molotov-Ribbentrop Pact. State Archives of Latvia 2197-1v-31, p. 228. 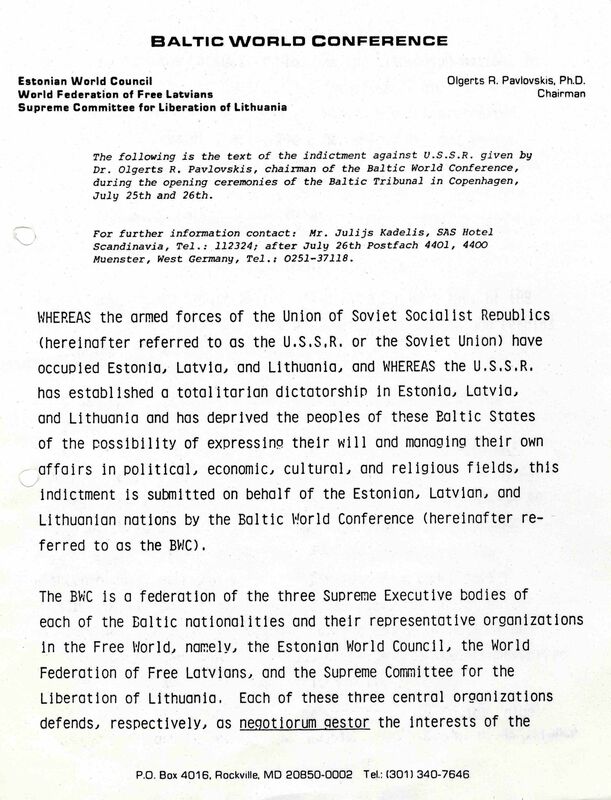 The October 2, 1980, press release signed by PBLA Information Bureau director Jūlijs Kadelis. It states that PBLA submitted a memorandum on the behalf of the Baltic World Conference to the participants of the Conference on Security and Cooperation in Europe in Madrid. 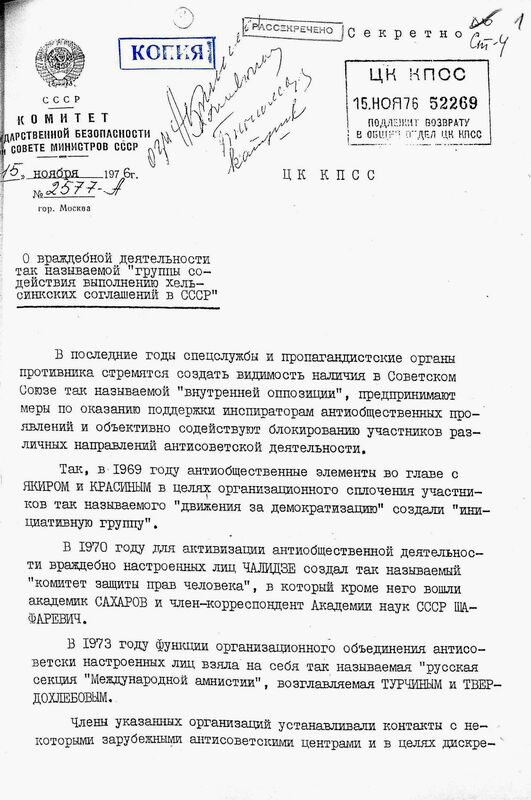 The memorandum described how many of the signers of the August 23, 1979, Baltic Charter had been arrested and imprisoned, and it appealed to the participants of the conference to include in their final act a demand that the USSR release imprisoned dissidents, including the signers of the Baltic Charter. State Archives of Latvia 2197-1-v- 29, p. 289. The October 19, 1979, report of the CPSU Central Committee Foreign Policy Propaganda Section to the CPSU Central Committee “Regarding the preparation by the United States of new political sabotage in conjunction with the upcoming Madrid meeting”. The report states that some of the members of the US Congress House of Representatives who are connected to the Baltic, Ukrainian and Belorussian emigrant communities are asking that the upcoming Conference on Security and Cooperation in Europe in Madrid consider the issue of Latvia, Lithuania, and Estonia. They want the conference participants to discuss the illegal annexation of these nations by the USSR and the refusal of the USSR to grant them the right to national self-determination and territorial independence. Russian State Archive of Contemporary History 89-31-22, 1-3. p.
Rev. Māris Ķirsons demonstrating against the occupation of the Baltic States outside Madrid's Palace of Congress on October 11, 1980, during the Conference on Security and Cooperation in Europe. 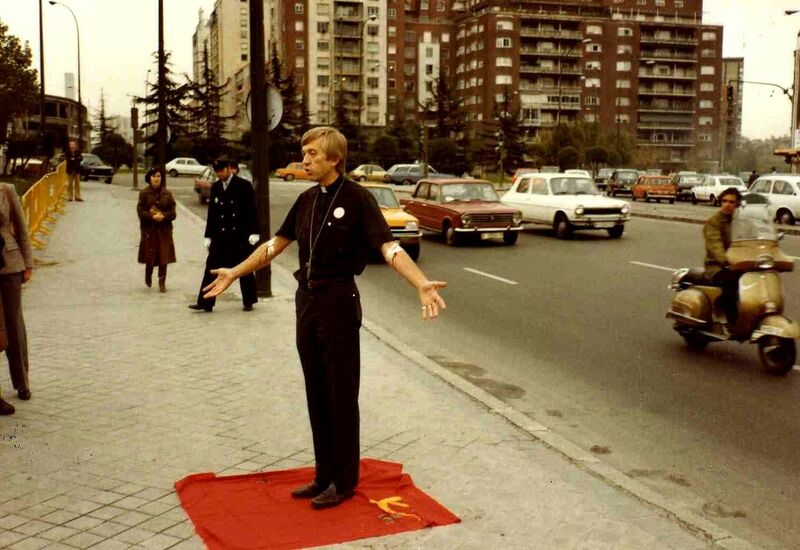 Blood from his veins dripped onto a USSR flag. Ķirsons was one of 70 Latvian exiles who demonstrated against the occupation of the Baltic States during the conference in Madrid. 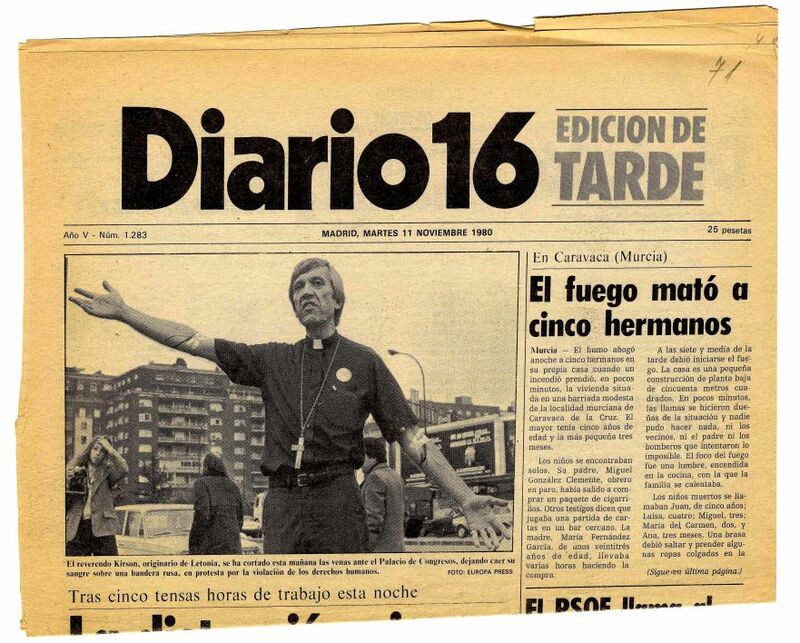 An excerpt from the front page of the Spanish newspaper “Diario 16” showing a photograph of Māris Ķirsons. Ķirsons demonstrated against the occupation of the Baltic States on October 11, 1980, outside Madrid's Palace of Congress during the Conference on Security and Cooperation in Europe. State Archives of Latvia 2219-1-v-33, p.71. Latvian exiles demonstrating in Madrid on October 11, 1980, during the Conference on Security and Cooperation in Europe. State Archives of Latvia 2197-1-v-43, p.15. 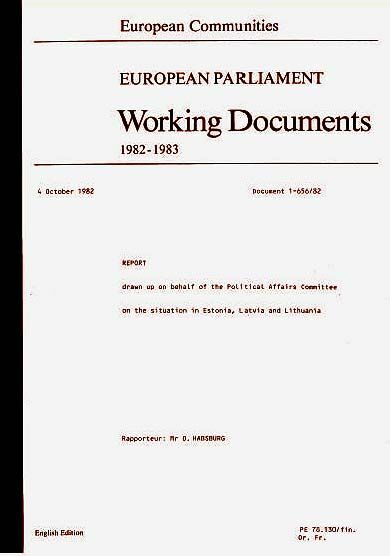 This is the way European Parliament member Otto von Habsburg's October 4, 1982, report on behalf of the Political Affairs Committee regarding the situation in Estonia, Latvia, and Lithuania was registered in the European Parliament's 1982-1983 document summary. Habsburg's report prepared the European Parliament to accept the “Resolution on the Situation in Estonia, Latvia, and Lithuania” on January 13, 1983. Official publication of European Parliament working documents, 1982-1983. Document No. 1-656/82. The European Parliament's January 13, 1983, “Resolution on the situation in Estonia, Latvia, and Lithuania”. 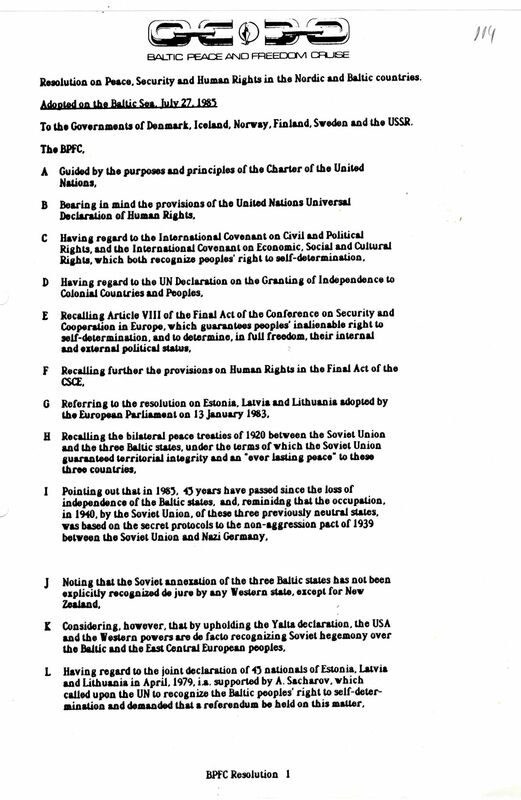 The resolution refers to the Baltic Charter signed on August [the document erroneously states April] 23, 1979, by Baltic dissidents which appealed to the United Nations to recognize the right of the Baltic States to self-determination. Official publication of European Parliament working documents, 1983. Document No. C42/78. The September 25, 1985, letter from the Czechoslovak writers' and human rights movement “Charter 77” to the Budapest Cultural Forum. The signers of the letter expressed their worries to the Forum regarding the Communist regime's distortion of Czechoslovak history and its threat to Czechoslovak national culture. The leaders of the World Federation of Free Latvians (PBLA) noted the similarities with the situation in Latvia and acquainted themselves with the letter. 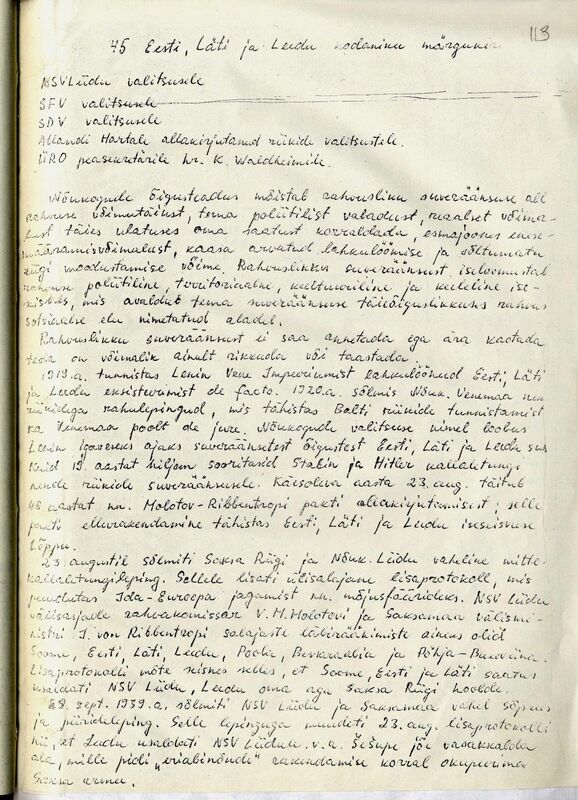 State Archives of Latvia 2197-1v-31, p. 152. Both the 1979 Baltic Charter and the 1983 European Parliament resolution on the situation in Estonia, Latvia, and Lithuania influenced the next steps towards the restoration of Baltic independence. 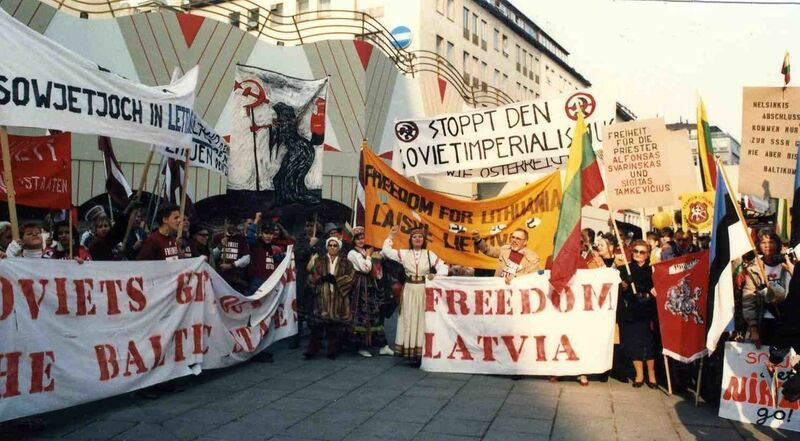 In an effort to turn the attention of the international community to the fact that the Baltic States were occupied and had a right to independence, Baltic exiles organized the Copenhagen Tribunal and the Baltic Peace and Freedom Cruise in 1985. The Copenhagen Tribunal on July 25, 1985, acted as a trial of the Soviet occupation of the Baltic States. Prominent judges listened to Baltic witnesses: lawyers, human rights advocates, and witnesses of repressions. Approximately 1000 articles about the tribunal appeared in the Western media. The Baltic Peace and Freedom Cruise set sail in the Baltic Sea at the same time as the tribunal was taking place. Cruise participants organized demonstrations in Stockholm and Copenhagen and demanded Baltic freedom. On July 27, 1985, participants in the tribunal accepted a resolution on peace, freedom, and human rights in the Nordic and Baltic countries. The resolution also made reference to the Baltic Charter of August 23, 1979. 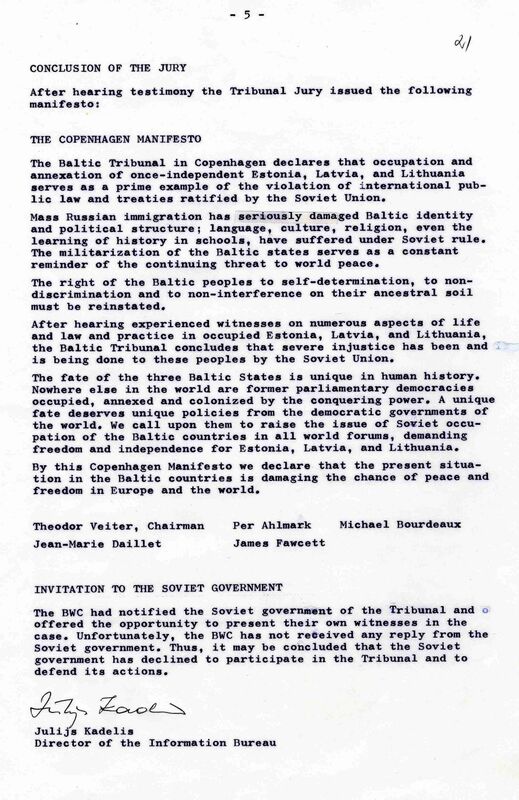 The Baltic Tribunal in Copenhagen on July 25-26, 1985, against the Soviet Union's occupation of the Baltic States and the policies carried out as a result of the occupation. State Archives of Latvia 2253 - 1-v-5-130. The manifesto of the 1985 Baltic Tribunal in Copenhagen declared that the occupation and annexation of formerly independent Estonia, Latvia, and Lithuania is in violation of international rights and treaties ratified by the Soviet Union. The mass migration of ethnic Russians has greatly traumatized the identity and political structure of the Baltic States; the Baltic languages, cultures, and even the teaching of history in Baltic schools have suffered as a result of Soviet rule. 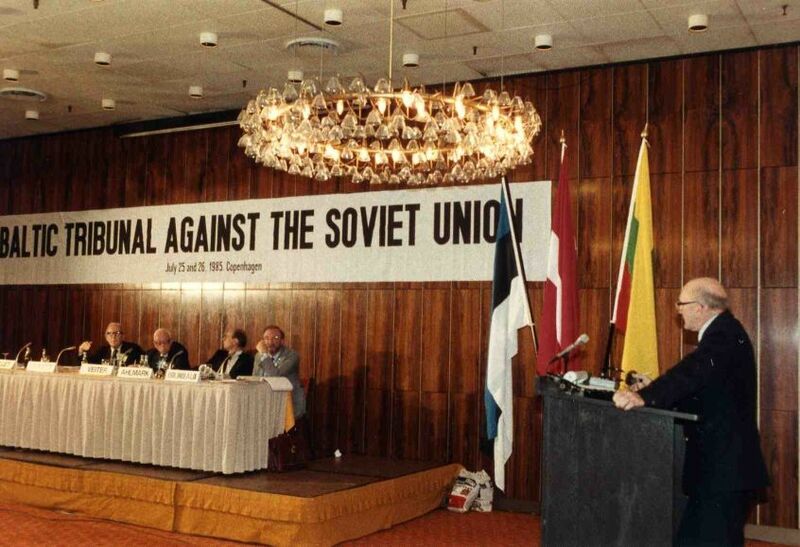 The manifesto also demands the restoration of Baltic rights to self-determination, an end to discrimination and interference in the internal affairs of the Baltic States, and the inclusion in all international forums of the Baltic issue and the accompanying demand for Estonian, Latvian, and Lithuanian freedom and independence. Latvijas Valsts arhīvs, 2197.f., 1-v apr., 27 l., 21.lp. Baltic exiles marching from the port to the center of Stockholm after the conclusion of the Baltic Peace and Freedom Cruise. Photo by L. Niedre. State Archives of Latvia 2219-1-v-46, p.2. 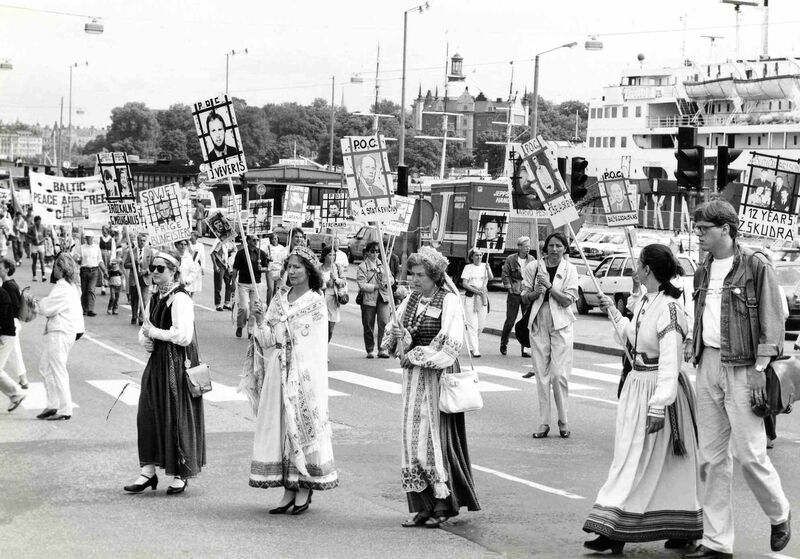 Baltic exiles demonstrating in Stockholm during the Baltic Peace and Freedom Cruise on July 29, 1985. State Archives of Latvia 2253-1-v- 52, p.27. 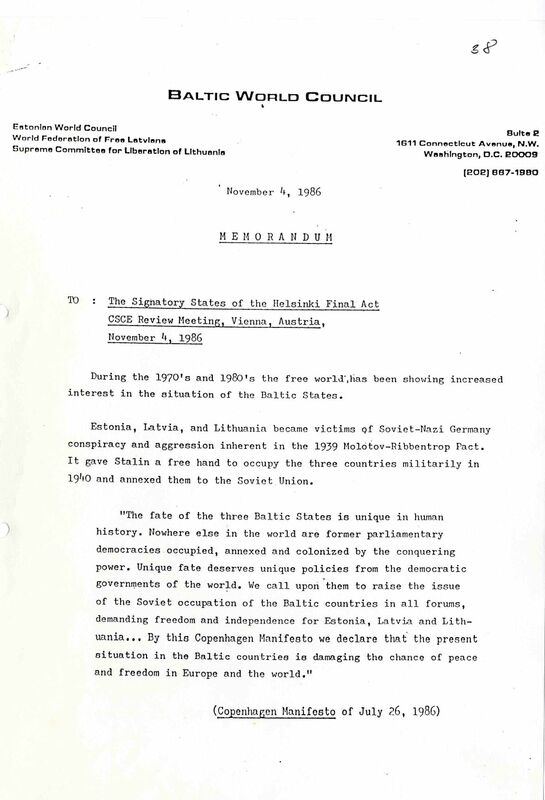 The World Baltic Conference's (comprised of the Estonian World Council, the World Federation of Free Latvians, and the Supreme Committee for the Liberation of Lithuania) document regarding the presentation by its chairman, Oļģerts Pavlovskis, at the Baltic Tribunal against the Soviet occupation of the Baltic States in Copenhagen on July 25-26, 1985. Pavlovskis explained that during the tribunal the World Baltic Conference represented the oppressed Estonian, Latvian, and Lithuanian peoples living in the USSR. He also declared that the USSR violates international rights by forcing Baltic people to serve in its military forces. The Baltic soldiers are forced to serve outside of their homelands and to take part in military actions abroad, such as in Hungary in 1956, Czechoslovakia in 1968, and Afghanistan beginning in 1979. State Archives of Latvia 2197-1-v-27, pp. 33-36. 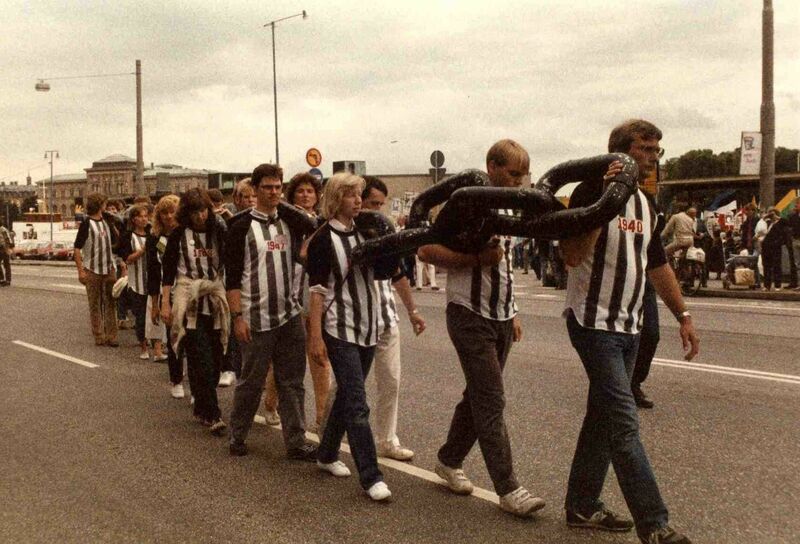 Baltic exiles demonstrating in Copenhagen during the Copenhagen Tribunal and the Baltic Peace and Freedom Cruise on July 25-26, 1985. National Museum of Lithuania MP 6441/6, 17. 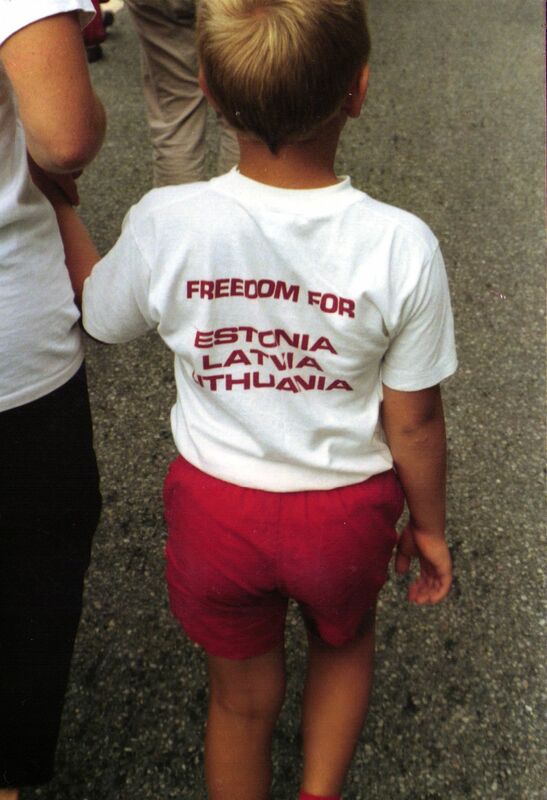 A young demonstrator at the Baltic exile demonstration in Copenhagen during the Copenhagen Tribunal on July 25-26, 1985. National Museum of Lithuania MP 6441/6. 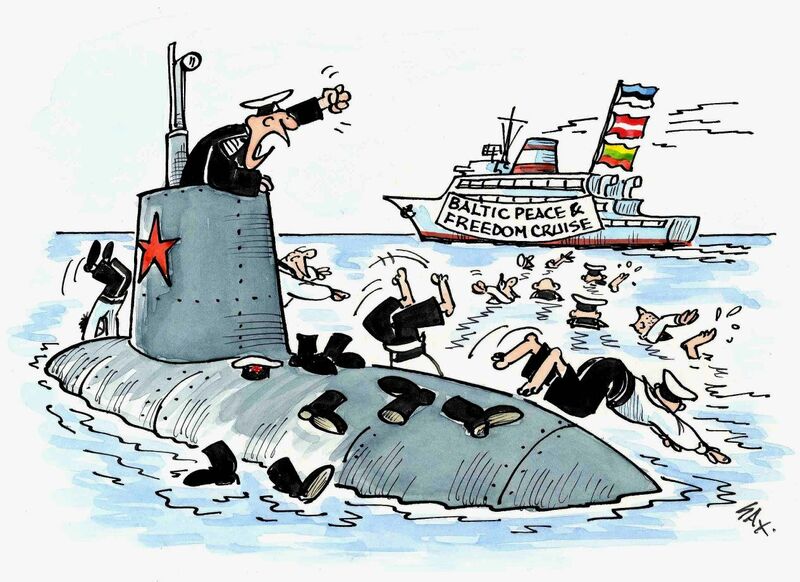 Drawing by Vitālijs Sarkans for the Baltic Peace and Freedom Cruise. State Archives of Latvia 2253-1-v-18, p.3. 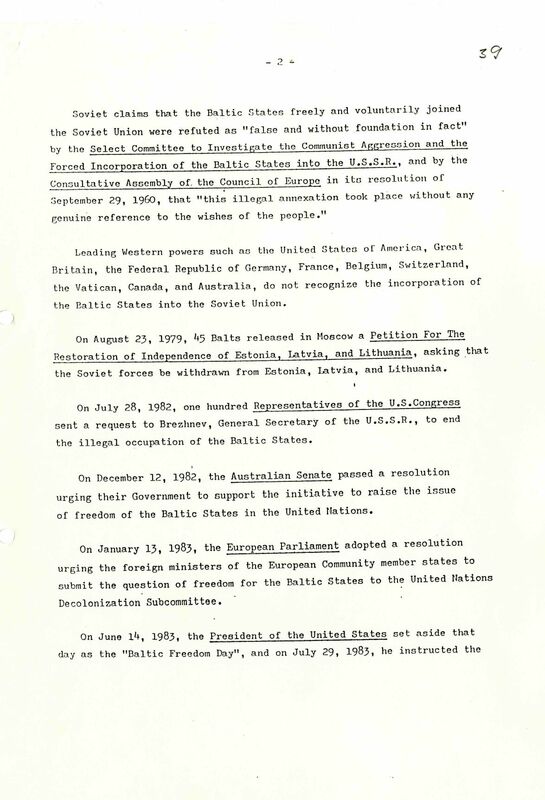 The resolution on peace, freedom, and human rights adopted on July 27, 1985, aboard the Baltic Peace and Freedom Cruise and addressed to the governments of Island, Norway, Finland, Sweden, and the USSR. 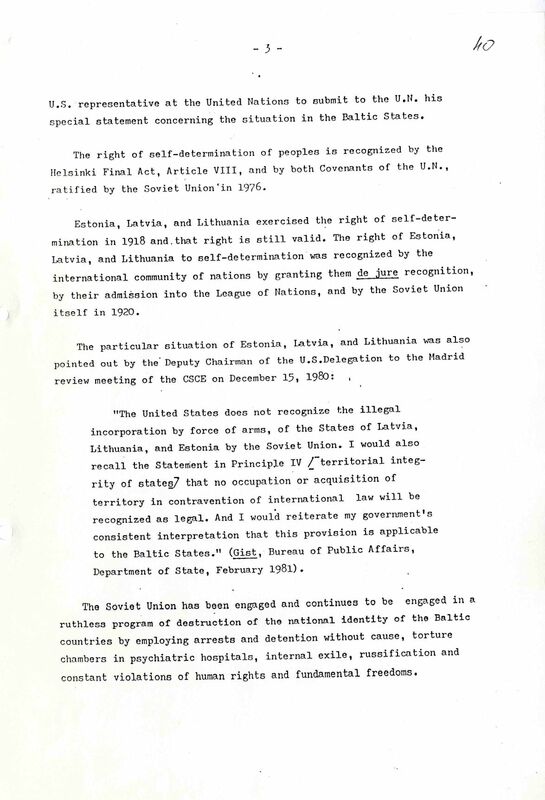 The resolution makes reference to the Baltic Charter signed by Estonian, Latvian, and Lithuanian dissidents on August 23, 1979. The resolution also states that, according to Paragraph 8 of the Final Act of the 1975 Helsinki Conference on Security and Cooperation in Europe regarding the right to self-determination of peoples, the Baltic peoples also have a right to self-determination. State Archives of Latvia 2197-1-v-56, p. 114. Baltic exiles demonstrating at the Conference on Security and Cooperation in Europe in Vienna on November 3-5, 1986. State Archives of Latvia 2219-1-v-47, p. 6. Photo by Ilgvars Spilners. 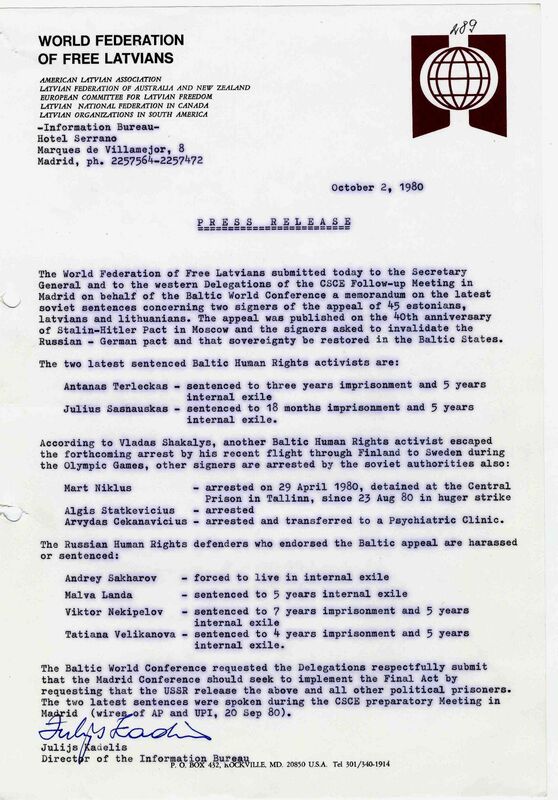 The November 4, 1986, memorandum by the World Baltic Council (comprised of the Estonian World Council, the World Federation of Free Latvians, and the Supreme Committee for the Liberation of Lithuania) during the Conference on Security and Cooperation in Europe on November 3-5, 1986, in Vienna. The World Baltic Council made reference to the manifesto agreed upon at the Baltic Tribunal against the Soviet occupation of the Baltic States on July 25, 1985, in Copenhagen, and urged the Vienna conference to review the issue of Baltic occupation, as well as recognize the Baltic States' right to sovereignty without interference from other nations. State Archives of Latvia 2197-1-v-35, pp. 38-41. 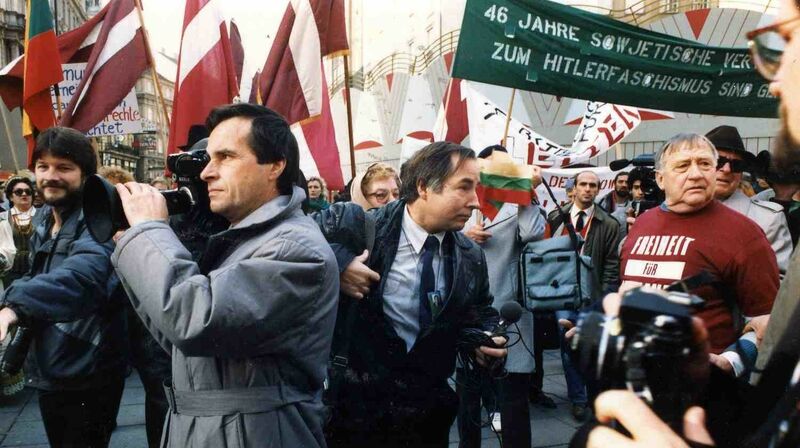 Journalists from Moscow at the Baltic demonstration in Vienna on November 3-5, 1986. State Archives of Latvia 2219-1-v-47, p. 3. Photo by Ilgvars Spilners. 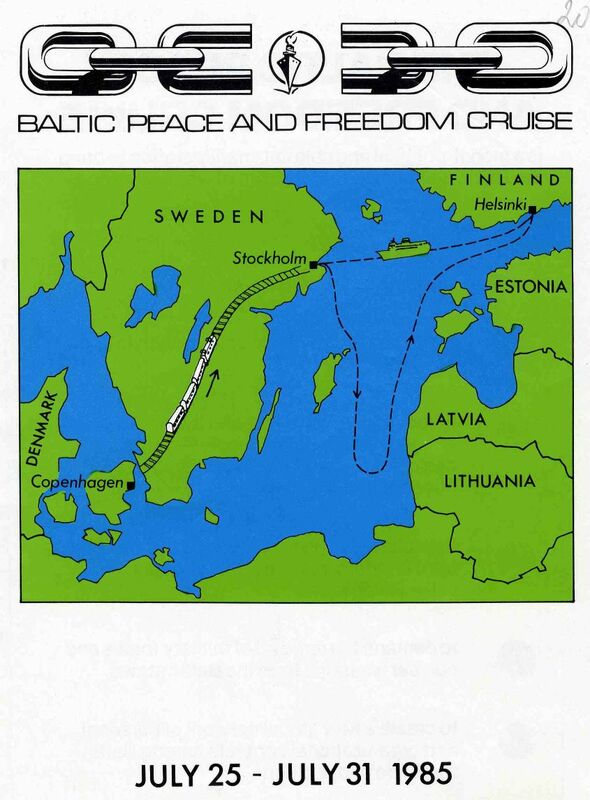 The route of the Baltic Peace and Freedom Cruise. State Archives of Latvia, 2253. f., 1-v apr., 15. l., 20. lp.